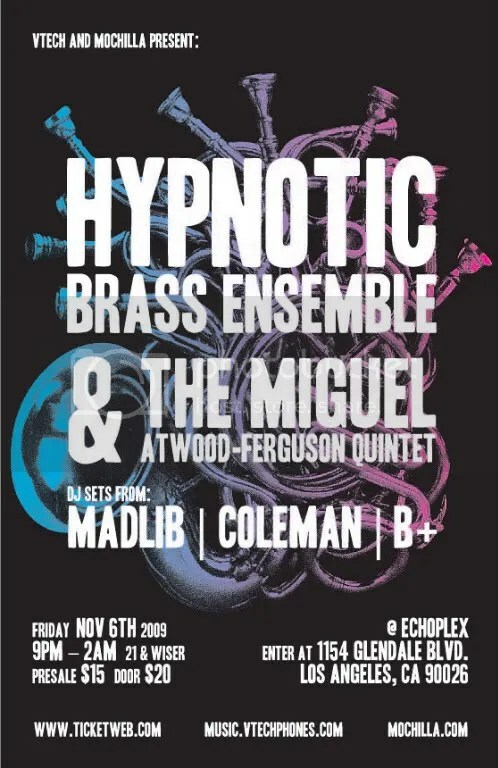 Hypnotic Brass Ensemble, Miguel Atwood-Ferguson, Madlib +more! Hypnotic Brass Ensemble are a family, literally. They are the heirs to the great musical tradition of Chicago. Their father Phil Cohran trained them from aged three to play hard, fast and together. They boast a fan base as wide and eclectic as Barack Obama, David Byrne, Q-Tip, Jay-Z, Erykah Badu, Jools Holland and thousands more. Now with the news that they along with Mos Def and drummer extraordinaire Tony Allen will form the new Gorillaz outfit, you realize that this is no ordinary collective. The Hypnotic Brass Ensemble (HBE), a band comprised of eight brothers, all sons of Sun Ra trumpeter and songwriter Phil Cohran, have been playing since they were three years of age and have inherited a lineage deeper than most bands will ever attain. Raised on the south side of Chicago, their musical heritage is rooted in their genes. They have brothers and sisters that are professional musicians, their mothers are singers and their father, Phil Cohran, a legendary visionary and teacher has music experiences from the 1940s in St. Louis to his seminal role with Sun Ra in Chicago in the 1950s. As Sun Ra moved to the east coast in 1960, Cohran stayed behind in Chicago to be with his family. As his children grew, Cohran worked as a musical activist and educator, which led to the establishment of the Sun Ark in a warehouse behind their family home. At night while the children slept, they would hear their father rehearsing with his band the ‘Circle of Sound.’ At six in the morning, they were awoken to practice music for several hours before going to school. From an early age they were a central part of their father’s Youth Ensemble. At night they listened to NWA and Public Enemy, and Ice Cube and Eazy-E were their heroes. By the end of the nineties, with everyone out of school, they concentrated on their music full time. With a mix of their jazz roots and their hip-hop sensibility, they made a living for themselves on the streets of Chicago. While performing on a subway platform, they stumbled upon their name when a man who watched them for hours, missing train after train, proclaimed that he has been “hypnotized” by their music. With their composer skills aiding them to create a sound wholly their own, the group moved to New York City where they played with Mos Def and Erykah Badu. From a chance encounter in November of 2005, and support from numerous artists, the Hypnotic Brass Ensemble has released an album brimming with musical magic. Recorded on the back of the Africa Express trip to Lagos last October, during a three-day stop-over in London, with the drummer’s stool shared by Malcolm Catto from the The Heliocentrics, Sola Akingbola from Jamiroquai, and the one and only Tony Allen, and other musical luminaries Flea and Paul Simenon, this album is all that is cracked up to be and more. In May 2009, Blur and Gorillaz’s frontman Damon Alburn’s Honest Jon label dropped the Hypnotic’s first official full length studio album to accolades the music world over. With the sound, form, and structure in their musicianship and songwriting, the HBE have the ability to put on live shows that would put veteran bands to shame. 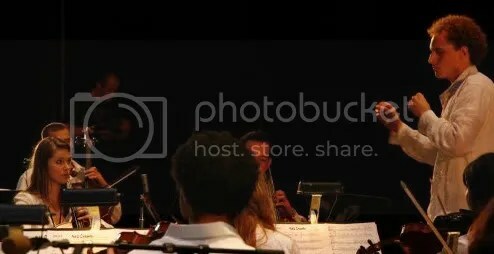 Born into a highly intellectual and creative family that exposed him to everything from classical to Motown to Jazz, Miguel Atwood-Ferguson has been dedicated to music literally his entire life. At age four while on a visit to a Suzuki Program Institute his brother was attending, Miguel was introduced to the violin and immediately developed an affinity towards it. He began composing at 12 and after high school studied classical viola performance at USC. Taking an unusual route for a string player, Miguel has been adamant about pursuing deeply involving and creative roles in the music making process such as composing, writing and producing original pieces. He has recorded with a vast array of legendary musicians from Ray Charles to Billy Higgins; he has performed with Stevie Wonder and at the Grammy’s, on MTV and BET. In 2008 he took on the daunting task of adapting the late J Dilla’s music to the orchestral format and made his debut as a conductor at the Timeless: A Suite For Ma Dukes concert where he directed an orchestra performing his Dilla-inspired compositions. One of the most unique qualities about Miguel is his inherent need to challenge himself and master new terrains, he has various different groups he performs with and one day he hopes to build his own orchestra. Madlib is one of the most ambitious and engaging figures in modern hip-hop history. An enthusiastic crate-digger and multi-instrumentalist with a deep reverence for jazz and soul, Madlib has an expansive style and deft touch for composition that makes him one of hip hop’s most sought-after producers. He began his career with hip-hop trio Lootpack, who debuted on Tha Alkoholiks’ 1993 album 21 & Over; but, it is through his decade-long relationship with Stones Throw Records that he diversified his musical output. Often shying away from the limelight, many of his releases have been under various aliases. In 2000, he released The Unseen under the guise of his alter-ego, Quasimoto. He followed up a year later with Yesterdays New Quintet, a project that infused his exploration of jazz with electronic style and hip-hop substance. Since 2003, Madlib has put out several releases reflecting his growing versatility: Shades of Blue, a jazz remix project for Blue Note; Champion Sound with J Dilla under the name Jaylib; and Madvillainy, his partnership with MF Doom. In 2008, he released Sujinho under the name Jackson Conti—a collaboration based around Brazilian percussionist Ivan “Mamão” Conti on Mochilla.